There are a limited set of Raj postcards showing battlefields, even after the fact. This conflict was with so-called "Hindustani Fanatics" who found sanctuary from the Sikhs in the mountains of Swat in the 1840s (they apparently survive to this day). 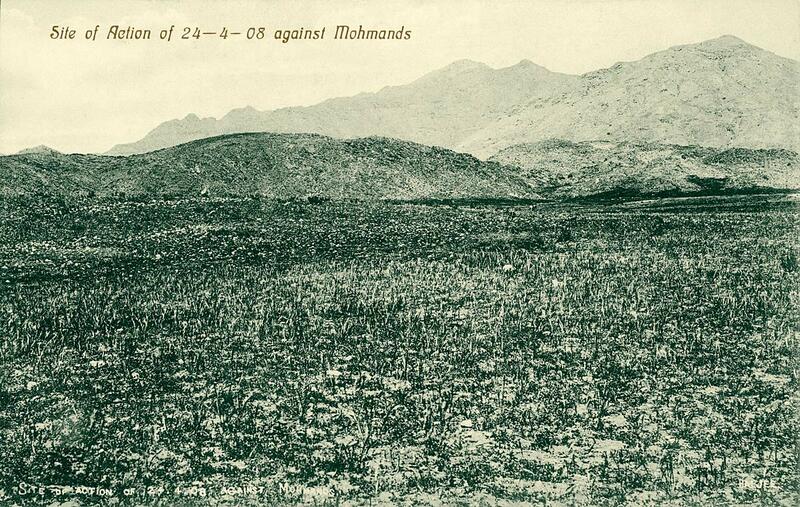 on April 24th, 1908 they inspired thousands of Mohmand tribesmen to launch an attack into Peshawar district. The Mohmands lived on arid land adjacent to the Khyber Pass, and often had no recourse but to raid settled areas. They were repulsed by British Indian troops; the press referred to the fighting as a "weekend war" even when, unusually, the fighting extended into the summer months. The Frontier areas bordering Afghanistan were the scene of frequent clashes during the Raj. The 2018 series 21 Sarfarosh - Saragarhi 1897 describes a heroic Sikh battalion at Forts Gulistan and Lockhardt on the Frontier involved in battles with Orakzai tribesmen during the great uprising of 1897 (which a young Winston Churchill witnessed and wrote about as a correspondent). The series is done in typical Bollywood style, and shows the careful balance that needs to be struck today between patriotism and anti-colonialism. The Pathan tribesmen are depicted, in many ways, through a stereotypical colonial lens that seems to have changed little, although it is nice to see such a long forgotten conflict find its way to a modern platform.